It's Not Work, It's Gardening! : Ladies and gentlemen... the beetles! 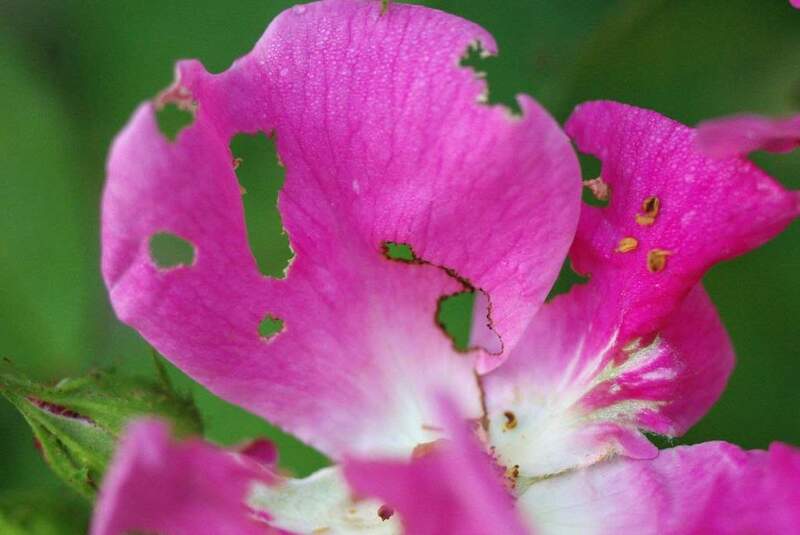 That's one reason that I don't grow more roses. Starting in mid-June and lasting about a month or 6 weeks I am unable to find an untouched rose bloom. Because I grow reblooming roses mainly, I do get to see some blooms before the beetles hit, and I know that I'll see more after they've ended their life cycles. 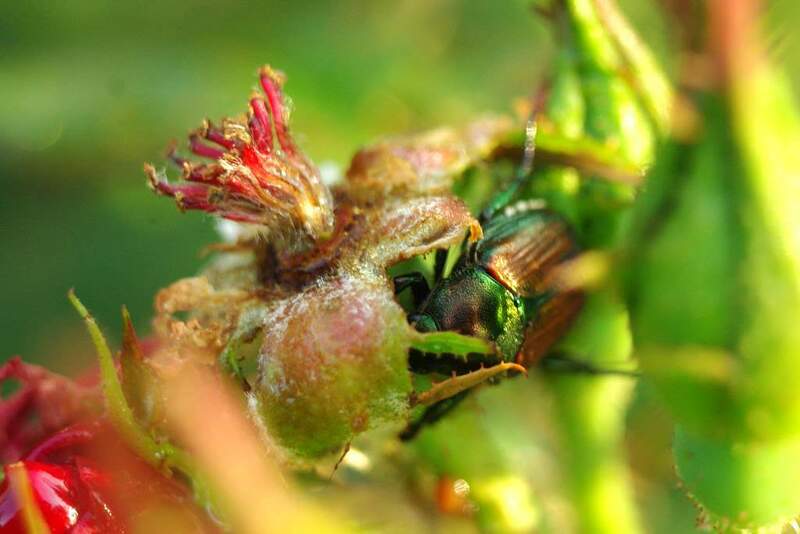 It's just not pretty during beetle season. They'll eat some other plants too. 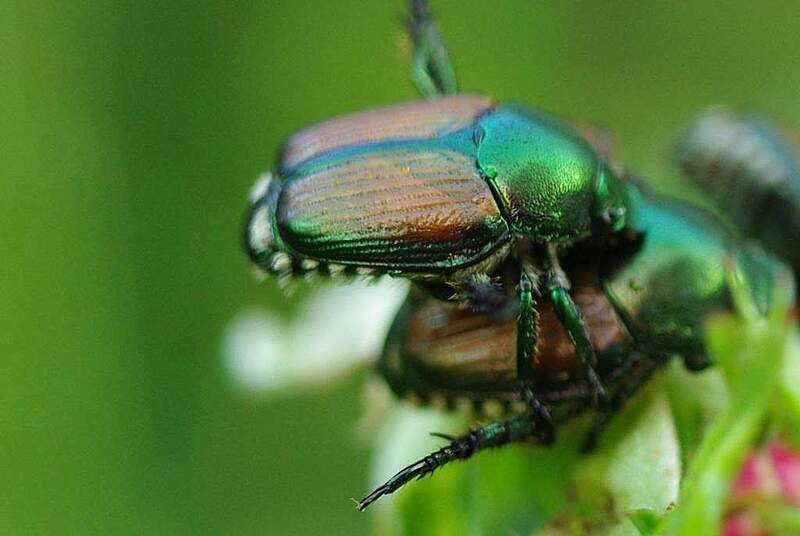 Although I have to admit that the beetles themselves are really quite beautiful. It hesitated for a moment (letting me refocus, which takes a lot of effort with the old manual macro lens I was using), then took off. I expect it choked and freaked out, unless that puffing noise is some sort of warning or sign of aggression. I didn't see any other deer though, so I suspect it was just choking. 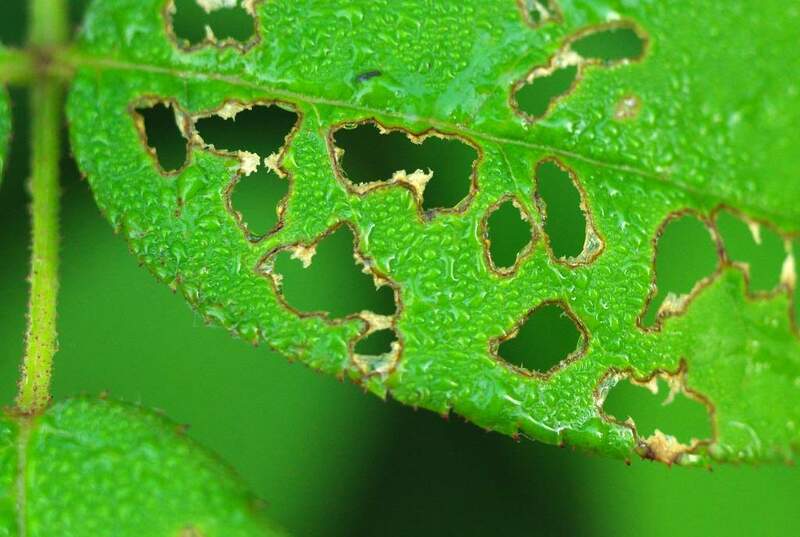 It was a nice reminder though that as much as the beetles may appear to be eating, it's nothing when compared to what the other pests in my garden can do with just a single bite. Horrible, but nothing compared to deer damage. This is easiest early in the morning when they're really sluggish, but since their instinct is to let go of the plant and fall to the ground when threatened, it's pretty easy to get them into the bucket. Not sure what to do with the drowned beetles once your bucket is full? Just leave the bucket on the ground and raccoons will eat all of the carcasses for you. 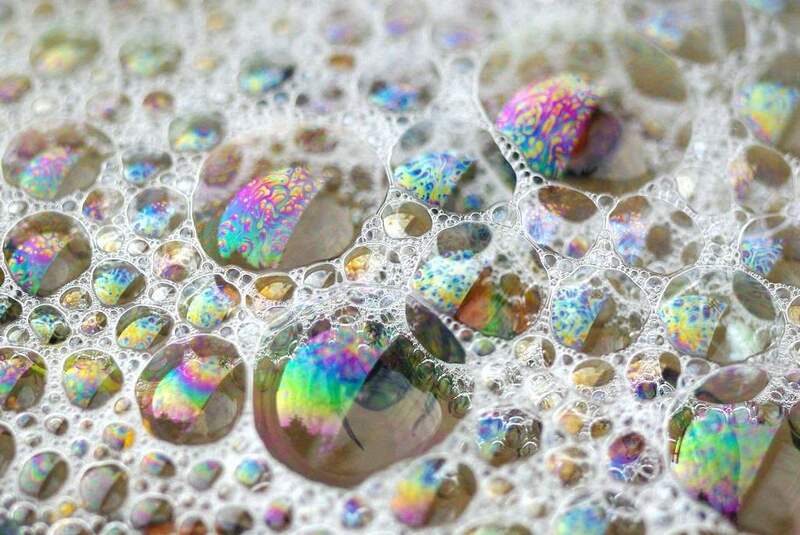 I must use a flavor of dish soap that they really like. I have to admit that I've been a bit lax in beetle hunting this year, although it seems like there aren't as many of them this year. Perhaps their numbers haven't peaked yet. 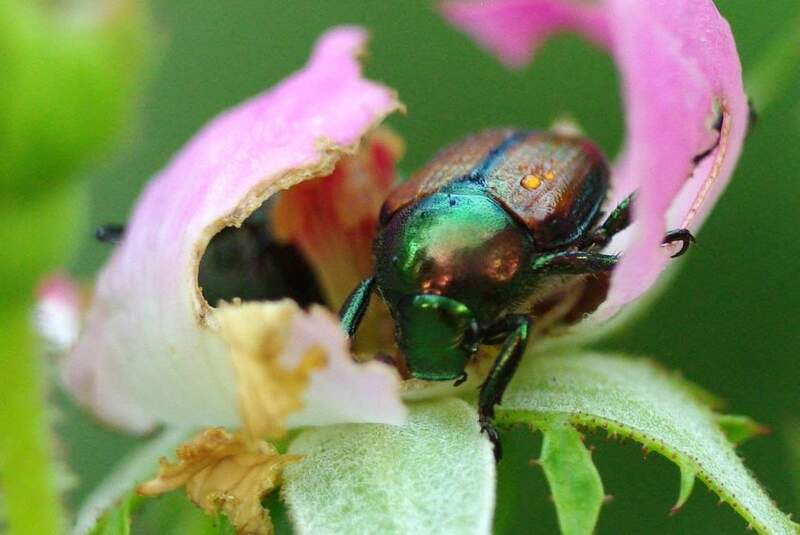 I expect I will have another Japanese beetle post in a couple of weeks, although I'm hoping there won't be a reason for one. Sometimes I wonder why we put so much effort into gardening ... its a never ending battle between us, the beetles, bugs and the elements ... all for a few weeks of perfection! I'm starting to understand why my friend "decked" his whole garden area. (just kidding, I don't really get that at all). 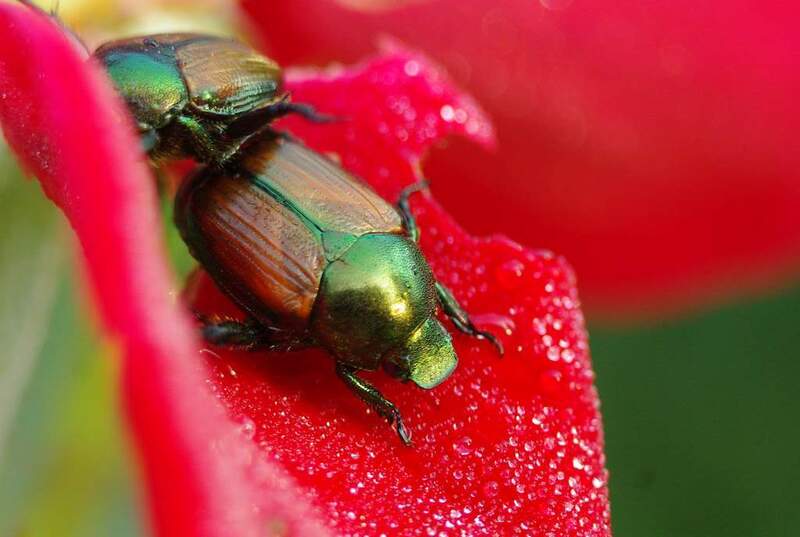 PS: I have to say I think those beetles are kinda attractive - all metallic and shiny. Very beautiful enemies. I was expecting the deer to give birth in the middle of the lawn. Will you now be shoveling raccoon corpses, foaming with washing up bubbles? Lucy: I hope not! Soapy beetles wouldn't be the thing to kill them I think. They eat some crazy things sometimes. 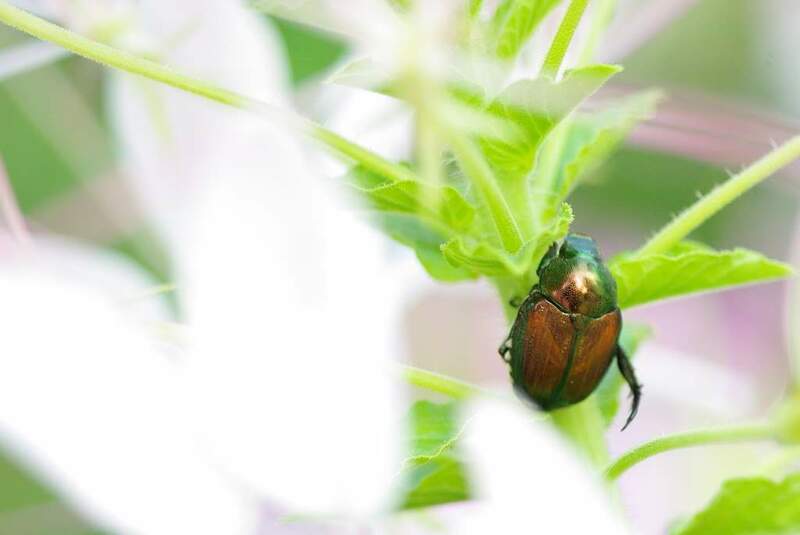 Alan, thats a rare site to see so many japanese beetles on one single plant. Out here they are just another beetle, thanks in large part to the USDA. They located Tiphia vernalis and Istocheta aldrichi in Japan and moved them to the eaastern United States in the late 1920's. I can say with s straight face I see perhaps 2-5 a year and most of those are dead. 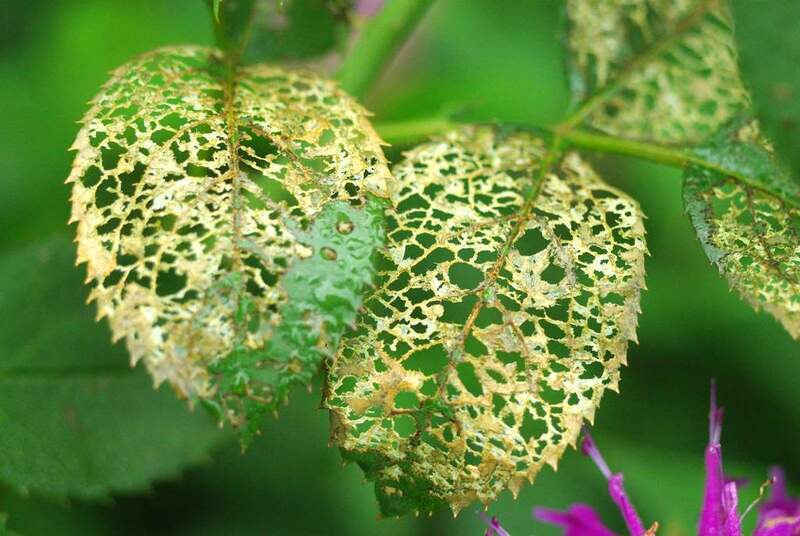 I have something eating the leaves on our variegated aralia, but I don't think we have Japanese beetles. They sure are beautiful! 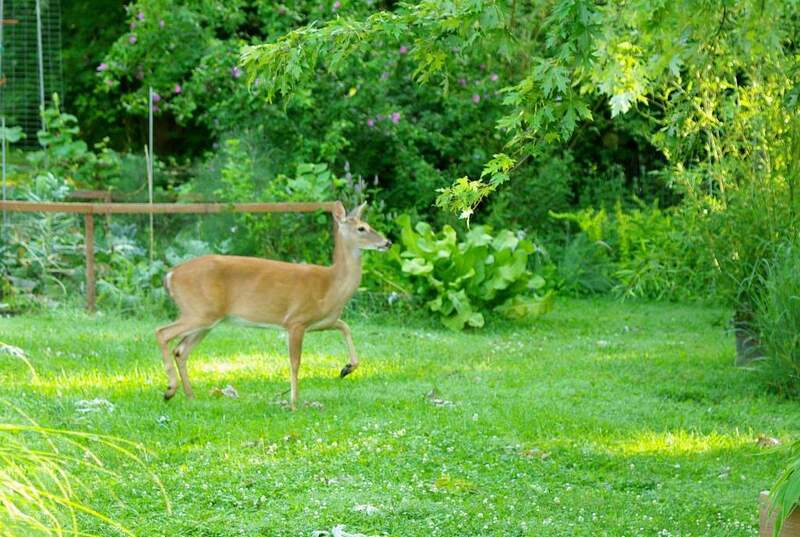 Very similar scene in my garden. 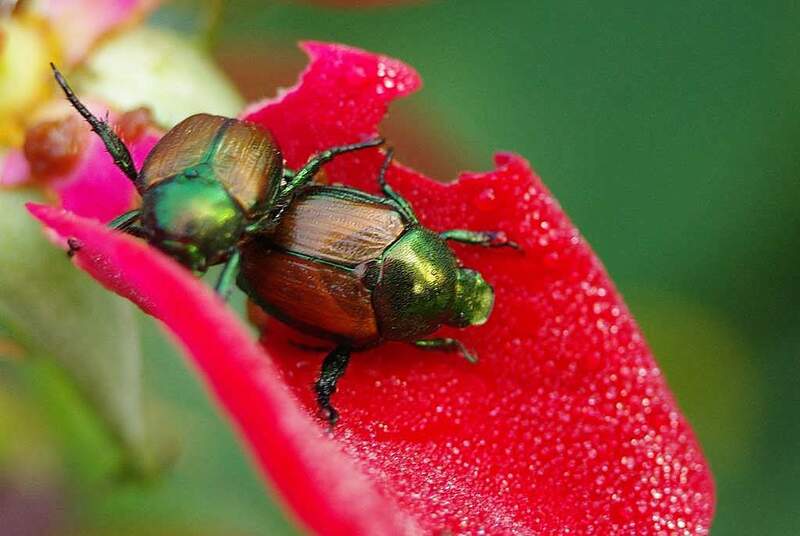 For some reason the Japanese beetles look bigger this year! My roses are in a disarray right now as well but will look gorgeous again come September. I have 55 knock out roses (builder put in) and I don't have the time nor patience to knock the beetles off into soapy water so sadly they continue their life cycle. Good to know that the raccoons will eat them if I do decide to make the effort! Best BLOG on the net! Read it everyday! The noise you heard was probably from the deer. Deer blow when they sense (most likely smell) danger. It can be very loud, somewhat sharp, and a little higher-pitched. Karin: do you have a leaf blower that vacuums too? 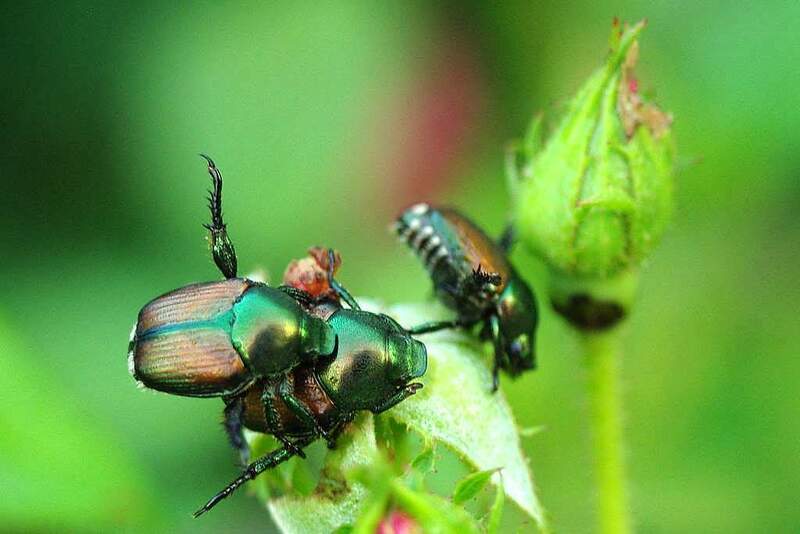 If I had 55 roses to de-beetle I might give that a try. Jeremy: thanks! I appreciate it! 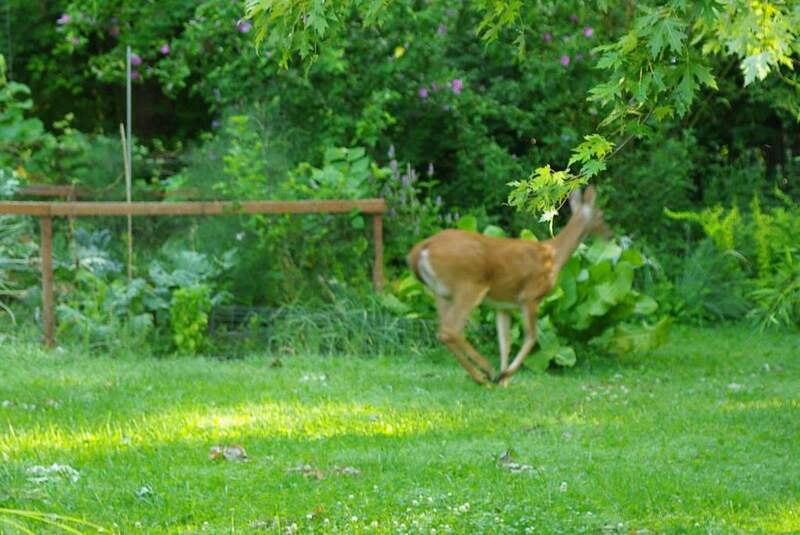 Oh my gosh, that deer was amazing, and the photo you got of it kicking up it's heels and heading off is one of a kind! It's a bit early here for JB's yet, but yes, they adore our roses. We do a lot of hand picking -- same as you, but we knock them into vegetable oil... 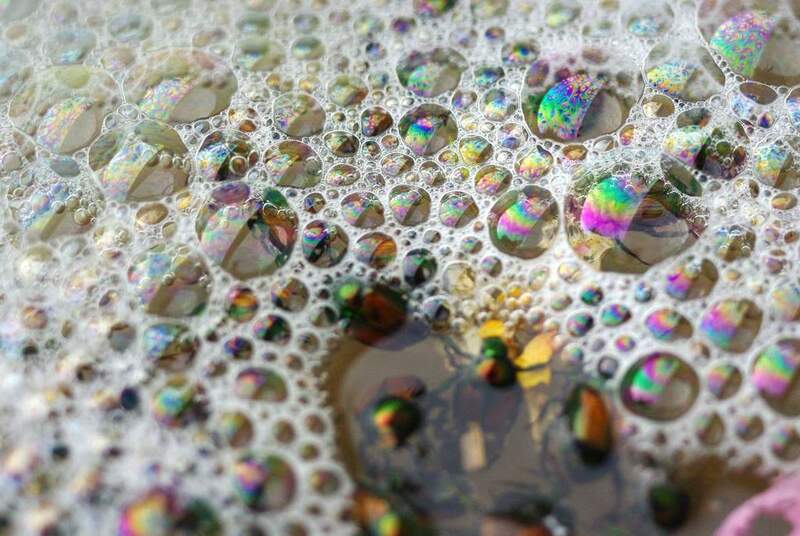 I've seen them fly out of soapy water! 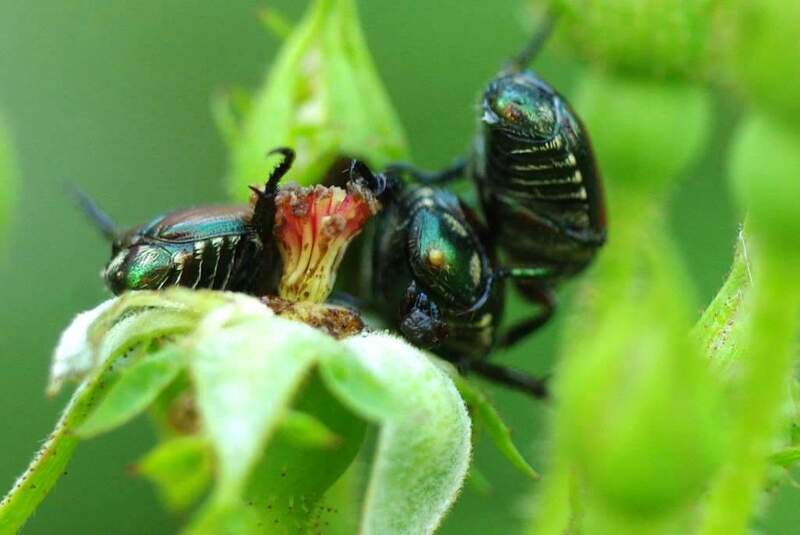 Spraying with Neem helps... but spray in the early AM before the bees come to pollinate. I just take a bottle, fill it up with something toxic, and flick them into it when they try to eat my plants. The problem is that these guys can fly and more will come so I need to check my plants periodically to make sure they are not getting devoured.